Greek name for the goddess of love. Among Orientals, addicted to sensuality, she was worshiped under many forms and figures. 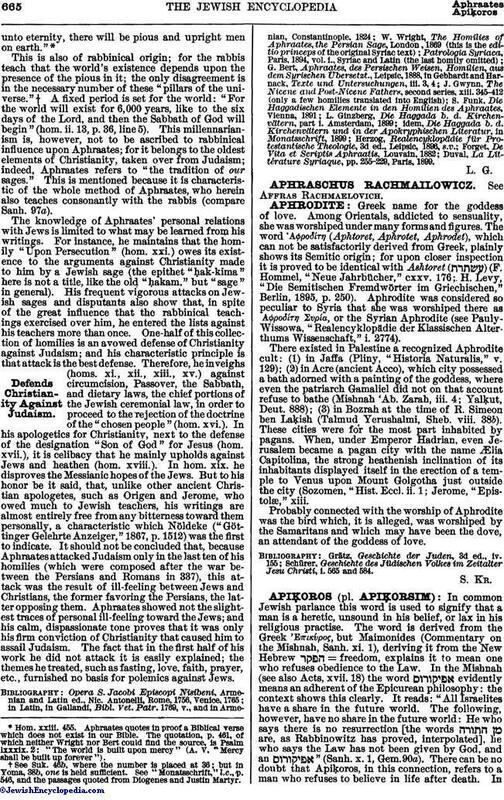 The word 'Aφρōδίτη (Aphtoret, Aphrotet, Aphrodet), which can not be satisfactorily derived from Greek, plainly shows its Semitic origin; for upon closer inspection it is proved to be identical with Ashtoret ( ) (F. Hommel, "Neue Jahrbücher," cxxv. 176; H. Levy, "Die Semitischen Fremdwörter im Griechischen," Berlin, 1895, p. 250). Aphrodite was considered so peculiar to Syria that she was worshiped there as 'Aφρōδίτη Συρία, or the Syrian Aphrodite (see Pauly-Wissowa, "Realencyklopädie der Klassischen Alter thums Wissenschaft," i. 2774). There existed in Palestine a recognized Aphrodite cult: (1) in Jaffa (Pliny, "Historia Naturalis," v. 129); (2) in Acre (ancient Acco), which city possessed a bath adorned with a painting of the goddess, where even the patriarch Gamaliel did not on that account refuse to bathe (Mishnah 'Ab. Zarah, iii. 4; Yalḳut, Deut. 888); (3) in Bozrah at the time of R. Simeon ben Laḳish (Talmud Yerushalmi, Sheb. viii. 38b). These cities were for the most part inhabited by pagans. When, under Emperor Hadrian, even Jerusalem became a pagan city with the name Ælia Capitolina, the strong heathenish inclination of its inhabitants displayed itself in the erection of a temple to Venus upon Mount Golgotha just outside the city (Sozomen, "Hist. Eccl. ii. 1; Jerome, "Epistolæ," xiii. Probably connected with the worship of Aphrodite was the bird which, it is alleged, was worshiped by the Samaritans and which may have been the dove, an attendant of the goddess of love. Schürer, Geschichte des Jüdischen Volkes im Zeitalter Jesu Christi, i. 565 and 584.